In three days of operations, the Russian aviation group in Syria has hit 258 targets belonging to the Islamic State and Jabhat al-Nusra terror groups, the Defense Ministry said. 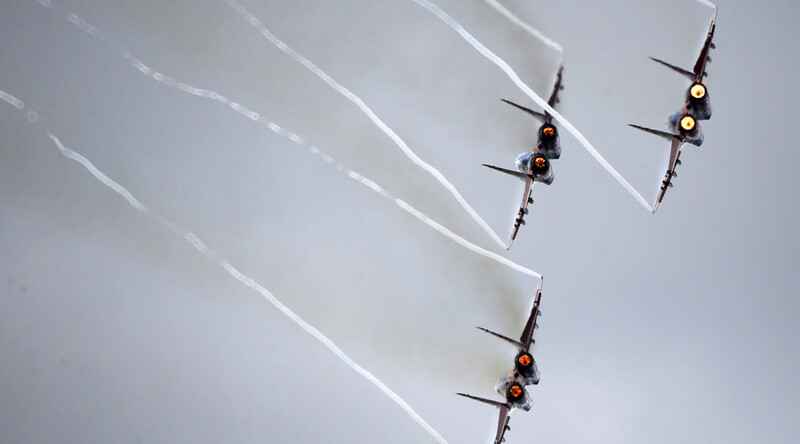 "Over the past three days, the warplanes of the Russian air group have carried out 164 sorties, hitting 285 targets,” Igor Konashenkov, a spokesman for the Ministry of Defense, said Monday. In the past 24 hours, 59 sorties were carried out, targeting 94 terrorist sites in the provinces of Hama, Idlib, Latakia, Damascus, Aleppo and Deir ez-Zor. Konashenkov said a large ammunition dump belonging to the Jabhat al-Nusra terror group has been destroyed in Syria’s Damascus province. The two metallic hangars were razed to the ground as munitions inside them detonated following a direct hit by a Russian bomber. In Aleppo, the Russian planes bombed an Islamic State command center used by the terrorists to coordinate their actions against the Syrian Army units near the Quaires airport, the spokesman added. In the same region, an Islamic State base equipped with anti-aircraft guns, mortars and heavy machine guns was destroyed in an airstrike. A video posted on the ministry's official YouTube channel also showed an airstrike in Hama. The Defense Ministry also denied a report by Human Rights Watch about suspected casualties among Syrian civilians allegedly caused by a Russian airstrike on a hospital. Konashenkov said that such claims were nothing but “stovepiping,” but are still “carefully monitored and analyzed” by the ministry. Such anonymous, unverified information is released especially for the purpose of being picked up by the Western media, he declared. Russia launched airstrikes targeting Islamic State and other terror groups in Syria on September 30, following a formal request from President Bashar Assad.